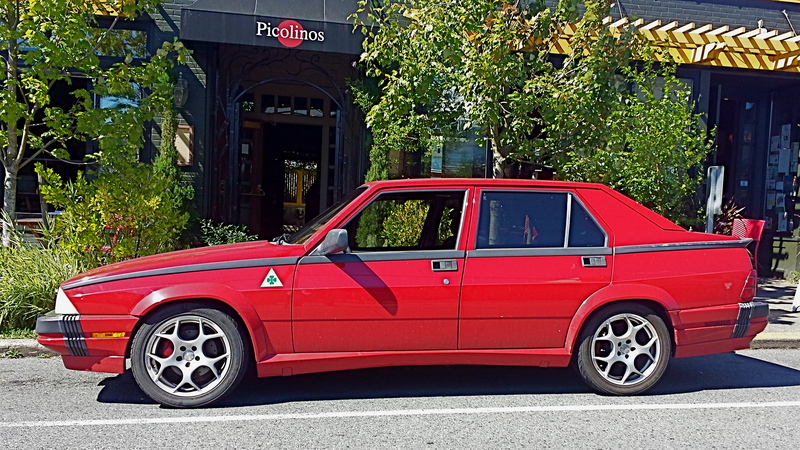 The Milano deserves the full Curbside Classic treatment, but when I encountered one at Bonello’s Pizza on a Tuesday lunch run, I didn’t have a camera, just my cell phone. The resulting pictures don’t do the car justice, but it would be a shame to toss them, so I’ll share what I have. The shots make the car look stubby and misshapen, a sin for any Italian manufacturer. In the flesh, the car looks quite pleasant despite that odd kick up behind the rear door. Typical for the time, the Italians offered up a stylish and well equipped car, but when it came to US sales, the cars were completely transparent. This shot captures the lines a bit better, but now emphasizes that odd character line running northwest of the rear wheel arch. I’ve seen that look on a few other cars, but only because of major body damage. Still, they say one of the attractions of Italian cars are those little quirks that set them apart. In Europe, this car was sold as the 75, in celebration of Alfa Romeo’s 75th year in business. Reading up on the car, I discovered it included some interesting technology. The driveline uses a front mounted engine driving a rear mounted transaxle. This design provided even weight distribution, but the engineers mounted the clutch on the transaxle. A quirky design choice, this meant the driveshaft spun at engine speed even when the car was sitting still. This must have been one of the last cars to receive a blue plate, since California went over to white and black plates in the mid-eighties. 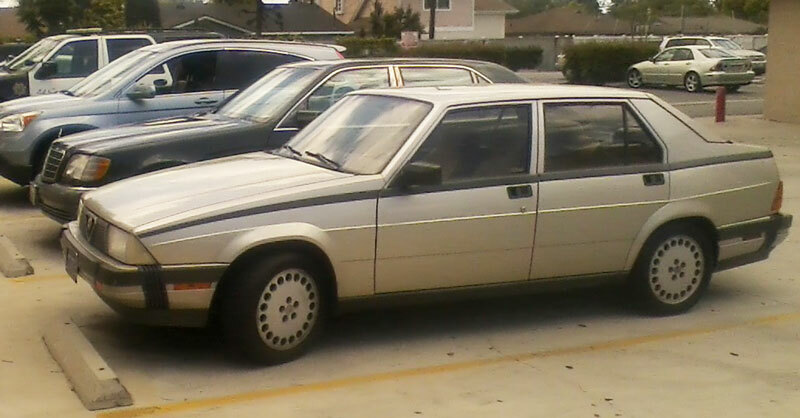 The Milano came to America in 1985 as an ’86 model, and was sold through the ’89 model year. The best year for the Milano was ’87, when Alfa moved 3,198 cars. Two years later, sales dropped to 1,443. This interior picture may help explain why the US lacked enthusiasm for the Milano. For the first two model years, the car only came with a five-speed stick. Hey, I’m a fan, but folks who buy mid level luxury cars expect an automatic on the option sheet. A shiftless option finally appeared in 1988, but by then the die was cast. You know, sometimes those Italian quirks led to reduced sales. 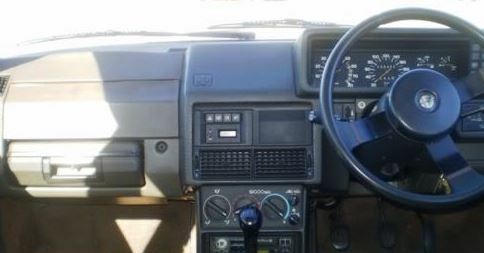 I grabbed this interior shot off the internet so you could see one more quirk- That U shaped parking brake lever. It reminds me of the automatic transmission selector levers in ’68-’72 Chevelles, but the lever in the Milano pulls up instead of sliding back and forth. I hope you enjoyed this Alfa despite the poor quality pictures. It’s always nice to see someone running errands in a Curbside Classic on a weekday afternoon, rather than keeping it in the garage waiting for a sunny Sunday afternoon. I worked for a guy who had a collection of Austin Healeys and Jags, and one of these was his dd. Apparently a very nice driving car, but from a styling POV a definite step back from their heights in the 70s. That plastic strip is just wrong. 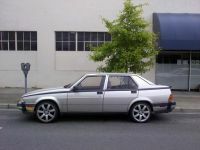 I found out the year of this Alfa by plugging in the license plate number on Carfax and doing a search, because there is a new feature that allows you to put in the tag number of any car in any state to search for car information without using the VIN. The car you photographed is a 1987, the first year the Milano was offered in the U.S., and it is a Milano Gold. Using my limited Alfa knowledge I’ll try to summarize what I know about it. Of the three trim levels offered on the Milano, the Gold was the midlevel one. All of them used the 2.5-liter “Busso” V6 that was first introduced in 1981 on the GTV6, this car’s immediate predecessor in the U.S. If this was a Verde, which was sold in 1988 and 1989 only, it would have the 3.0-liter V6 and ABS. 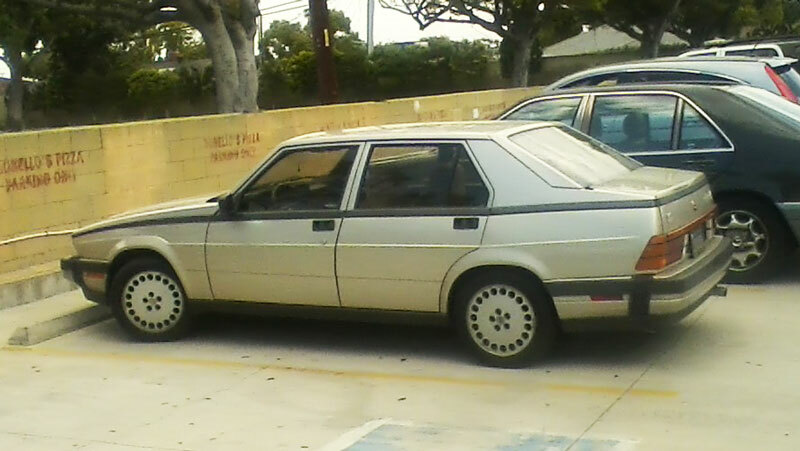 The Milano, known as the 75 elsewhere in the world, was the last RWD sedan Alfa Romeo designed and built before Fiat took over the company in 1986. Its successor, the 164, was FWD and was built with Fiat input. Unlike other European sedans of the time period, the Milano is a very maintenance-intensive car. Timing belts and water pumps must be changed every 30k miles or one runs the risk of having a blown engine. The rear brakes are “inboard” and are a pain to fix or replace. These cars are certainly not for the fainthearted, nor are they simple to repair, unlike a RWD Volvo with a redblock. the styling looks like it was in a rear end collision. i worked with a russian back in the 80’s who had one and after the timing belt replacement it demonstrated what an interference motor was like. Not one of Italy’s best styling exercises but there was some horrid styling going on all over.I don’t remember these in the UK but back then I was OK with my Mk2 Granada(European) and would have been scared off by the mechanical complexity, temperamental habits,rust issues and cost of parts for an Italian car.Someone at CC said the best way to enjoy one is to have a mate who’s got a perfectly running example and borrow it. These might have been a decent vehicle (?) , however the “styling” was so bizzare! The upswept rear quarter looked as if the car had been in a rear-ender and the owner was too cheap to fix it. Then for the designers to accent that feature with a heavy trim line, …stupid. It’s like a reverse image of my French Bulldog with a squashed rear instead of front. Alfa Romeo felt that the plastic trim was necessary, in order to conceal the fact that the doors and a lot of the body panels were shared with the Giulietta, Alfa Romeo´s mid sized sedan before the 75 (or Milano). These were very popular with italian law enforcement in the 80´s, and quite a few are still around here in Italy. I don´t think the U.S. market ever got the 1.8 turbo engine, which was considered one of the best mid sized sedans of the time. The styling wasn´t particulalry stunning, but keep in mind that european cars were not designed with the U.S. bumpers in mind, and euro spec cars do look much better without them. For a better pictoral representation, I offer up the two Milanos in my household. One of two I own. Now that looks great. I’m not usually a fan of big alloys, but the 75/Milano really needs something to increase the visual impact of the wheels. The stock ones were little caster-wheels. Fantastic car, I almost bought one several times. The guy that bought my ’84 Audi Coupe GT back in the mid-90’s had one – over 200,000 miles from new and all of it while titled in Vermont. No visible rust, just some battle scars. Supposedly these are easily the equal handling wise to a BMW E30 with a better noise from the engine. BMWs are no big deal in the cornering stakes not outside the US anyway Alfa would be preferable. +1 However much I try, my design eye has a hard time accepting those upswept quarter panel lines. It looks more like a mistake, than being intentional. It breaks the flow, in an awkward way. Your eye has to work, for it to seem integrated. But it doesn’t happen. The white rubbing strip draws your eye to the design error, leave that off it wouldn’t be so noticeable. It reminds me of a gussied up MK3 Jetta. 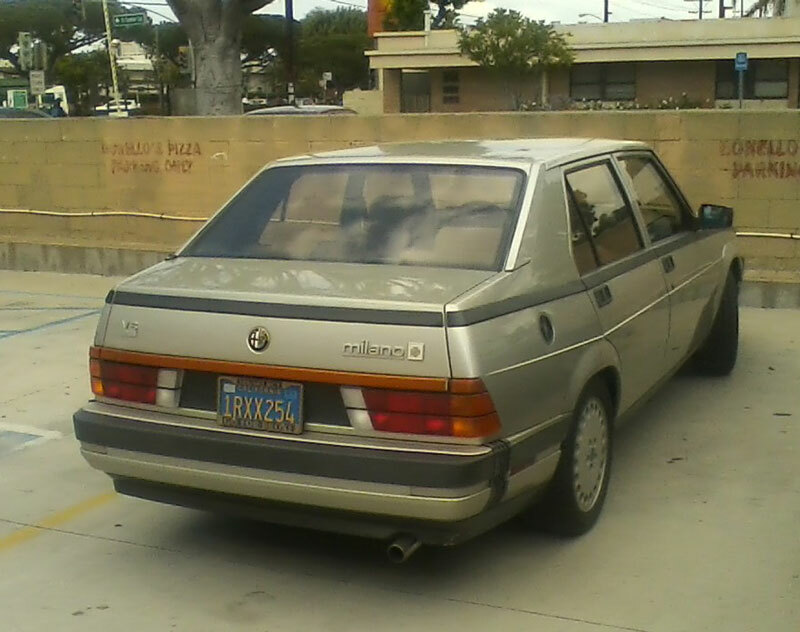 From the side view, you can see the profile of the later (unrelated) SAAB/Lancia/Alfa trio. 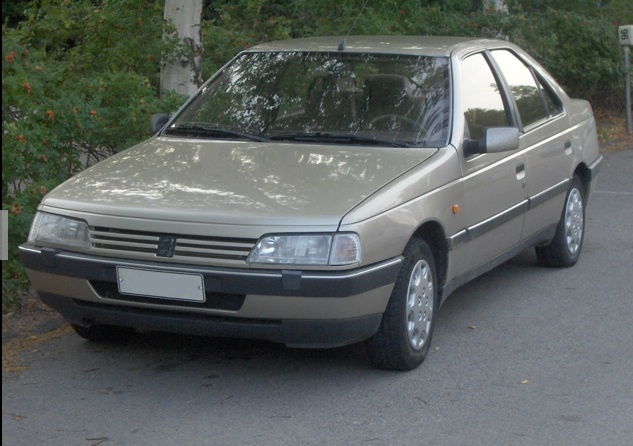 How about the 90s Peugeot 405. 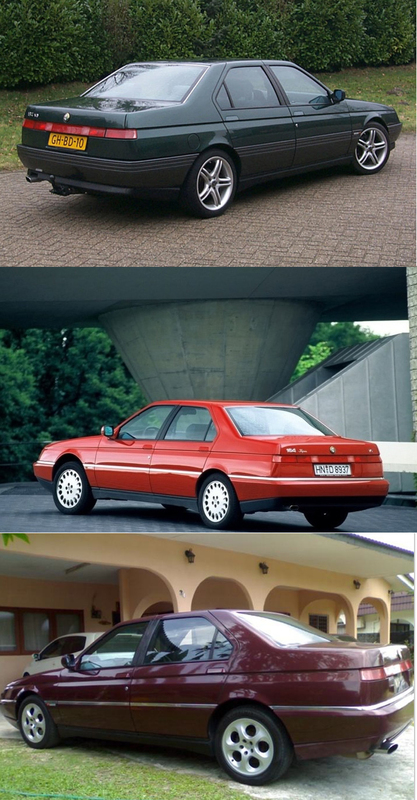 A more accurate comparison would be the Peugeot 605 to the Alfa 164. 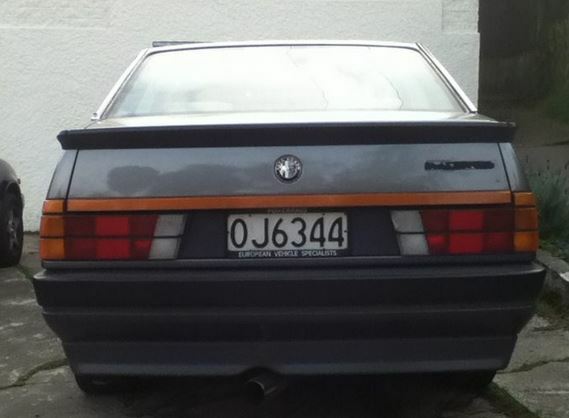 And the Alfa 164. Put a 405 next to a 164 and they look similar, but get a 605 next to a 164 and the platform relationship is very apparent. There was no platform relationship between Alfa Romeo and Peugeot. What those models apparently shared was the designer, Pininfarina. 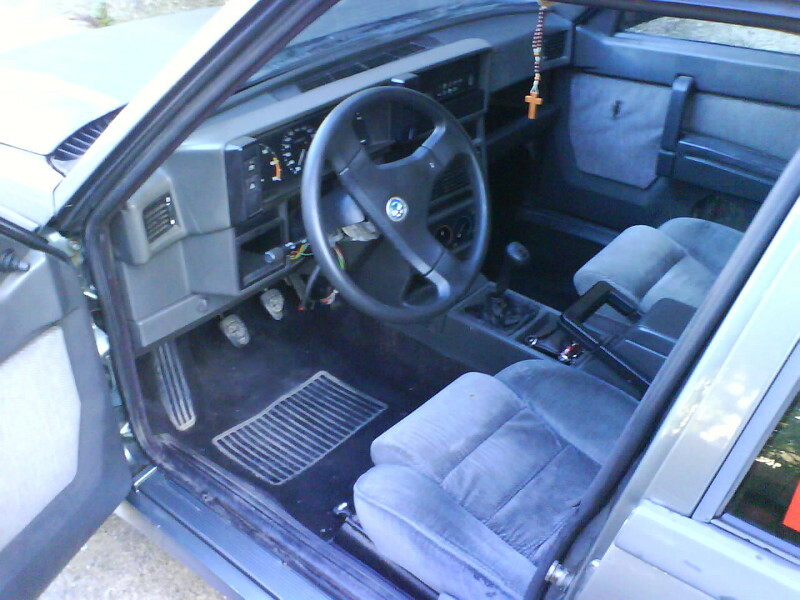 The Saab 9000, Fiat Croma, Lancia Thema and Alfa Romeo 164 had the same FWD platform back then. Johannes post is right (and does’t have a reply button…). The designer, Leonardo Fioravanti, at Pinninfarina designed the 405, 164 and 605. 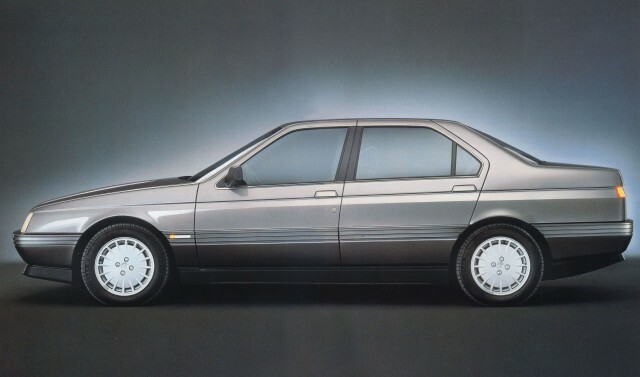 The 164 was designed first, but Alfa was slow to put it into production, so the 405 beat it to market. Were these a heavily face lifted Alfetta/90 ? I can remember seeing these when new and thinking that Alfa would soon be out of business. 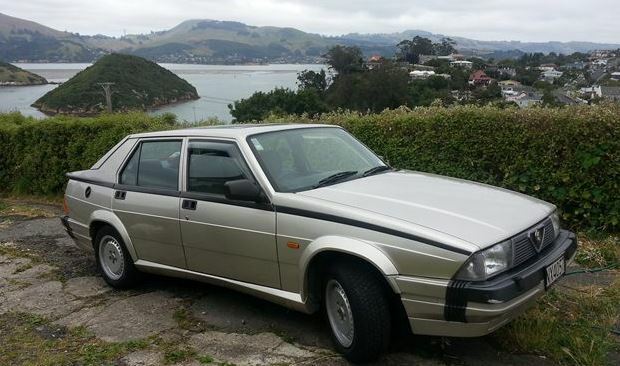 No, the 90 ran alongside the 75 in the product range, just like the Giulietta/Alfetta in the 70s. They were a facelifted Giulietta. Check out the doors and windshield – carryover. They used a similar (and just as awkward) upswept-tail theme when the Alfa 33 replaced the Alfasud. They might drive well, but – ugh! Well I’ll be darned Old Pete, until you mentioned it, I had no idea the Giulietta and 75 shared the doors etc, but now I’ve compared pics and dimensions (and consulted wikipedia), and I concur. You learn something new every day here at Curbside Classic! Carryover substructure happens more than makers let on, the side pressings and door frames on my Sentra were in production nearly 20 years and on multiple models the outside skins dont match up on some but the doors would swap over I ran a tape over some in my street I was looking to replace rusty beatup doors in the end I just nikkied it up. These cars remind me of a friend of mine, unfortunately no longer here. I met Steve at college, which was strange , as he already had his MBA at the age of 21. He drove a Red Milano gold with a stick. Strange car, power window switches on the roof, radio so low in the dash it was tough to operate. Not that fast (my Quad 4 Grand AM could smoke it) but a lovely motor sound. The car was a giant headache, as he called in the “Mylanta”. It looks very like a heavy handed facelift of the Alfa Guilietta from the early 80s which also had a rear transaxle.A good car to drive with lots of character but like all Alfas terrible build quality -terminal rust and bits of trim falling off into the floor wells and a very vague and sloppy gearbox made just about acceptable by its torquey engine that hung on in top very well.Looks like they bulked up the body and renamed it to try and give it a new start. The drivetrain of the Milano or 75 is inspired or adapted from the previous Alfetta series. And these are the last of RWD Alfa Romeo’s and Alfisiti believe this was the last REAL Alfa Romeo. I neverl iked these cars so much, the gearchange and linkage is not the best in the world but the car’s balance is great. But certainly not everybody’s friend. Today Alfa keep announcing the introdution of their new salooni n this makrt sector but they keep on posponing it. Many Alfisti are afraid they’ll use Chrysler underpinning but I say :: just do it, there is enough room today to tune the Chrysler platform into an Alfa. 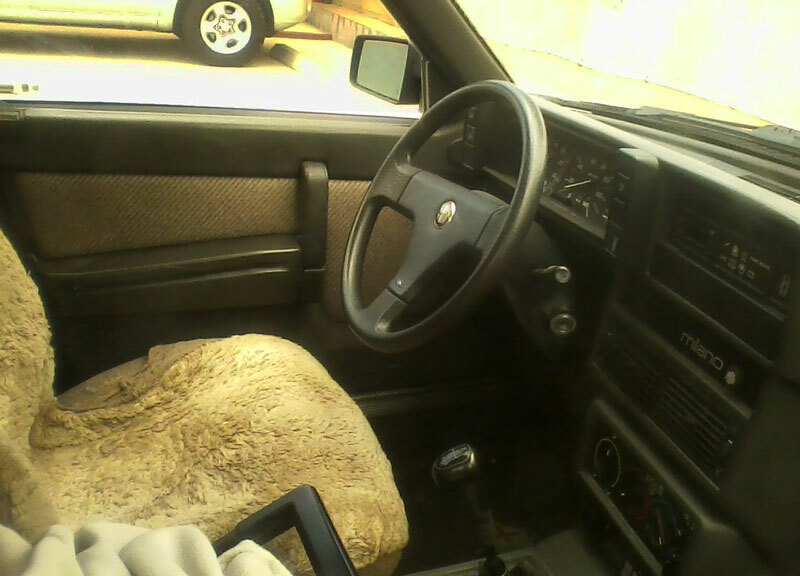 I drive a 159 Diesel, a FWD car, many people believe that FWD does not belong onthe larger Alafa saloon cars. But they forget this is ALFA FWD, the 159 is extremely stable at high speed cornering, even so stable the blood runs out of your brain when cornering at high speeds. One of the few cars that did this as well was the 1980’s Renault 5 mid-engined Turbo. This Milano is a typical old-scool Alfa, great to drive but clumsy in many other ways. When I compare it to my 159, they made a leap in built-quality. A 159 can handle anything “premium” German. In a charming Italian way. Around here they were Alfa 164. Then the chinese complained because 4 is an unlucky number; so the agent here re-badged it as a 168. Identical to the american model except for the acres of plastic trim. Photo shows both 164 and 168. I’m confused! The 164 was a separate line, and also came to the US a year or two after the Milano. The “big” Alfa of the time, it used a completely different platform and driveline, and was available with standard front wheel drive or optional four wheel drive. I had a Twin Spark and I loved it. It was always more or less broken, but when it ran it was the best car I’ve ever driven. I plan on getting a 75 V6 or a GTV6 as a project car at some point. I agree the 75 is not the most beautiful eye, but it’s alright and really it’s the appreciation of what it can do that seals the deal for me. Could have been worse, they could have done what they did in the 90, where the glovebox was actually a removable briefcase…! Rover 75s were not bad cars my BIL was parts manager at Parnell Rover in the 90s he had some as company cars in the days when NZs speed limit was merely a sugestion they get along ok.
All the jokes about the Milano looking like it’s been rear-ended reminded me that I did rear-end one once! I was following a Milano in the summer of 1987 in my 1979 Honda Accord, and the Alfa driver thought I had my brights on in his mirror. He stood on the brakes to stop and I slammed mine on, not yet knowing how to pump them. I tried to steer around him and skidded until I hit the left corner of his bumper with my right headlight. I was probably going about 5-7 miles per hour when I hit him. I smashed my headlight and put a 4 inch tall, 1 inch deep dent in the Honda sheet metal next to the headlight. His bumper was smashed in and none of his doors would open. I replaced my headlight and left the dent. My insurance had to pay $5,000 to fix his car. Seemed to be built of paper mache. Haha, I have the same car, same color, same wheels. It’s totally wicked when it isn’t busy being a garage queen. I’ve got the Ansa exhaust on and it sings! The Italians are good at making a car be the best it can be…briefly. Love this car. This always caught my eye when I was in high school and driving 70s American V8 which were cheap at the time. 80s kids think this is awesome.